The Dilapidated Marco Luethy Weblog - Weblog > It Swings And It Sways Until You Make It Your Own. It swings and it sways until you make it your own. Yes, yes.. I know.. I know.. It’s time for another one of those entries.. One of those entries where I type up a summary of what I’ve done the past few days during the past week. Not always the most fascinating.. Not always very interesting, but then again.. You don’t really have to read it. In fact, the summary is really more just for myself. One day I’ll be able to ponder, “Hm.. What was I up to when I was 20 years old.” And without any problem I’ll be able to go back to my already long standing weblog and see. Of course there are flaws to this. One of my major dislikes about this weblog is that I tend to censor a lot. Perhaps out of respect for peoples feelings, or perhaps because some private things about one person, another person should not necessarily know, to keep my parents happy, to not give my grandparents a wrong impression. All, perhaps in an effort to keep a somewhat neutral façade to remain on good terms with most people. But.. Oh well. It’s been a rather busy week. I stayed home last Friday evening (a week ago, now). On Saturday, September 2nd, after meeting up at Matt’s house, Matt, Isaac, Cory, Katie, Abby, Mallory, and myself drove out to San Bernardino to attend Nocturnal Wonderland (which took place at the NOS Event Center/Fair Grounds.) Here are some photos from the event that some person(s) I found via Google took. It looks like they just went around and took photos of people and the event. Anyway, we got there at around 18.00 and it ended at around 04.00 in the morning. Lots of energy, lots of dancing and good vibes. Even the cops joined in on the fun, taking pictures with people and having a good time. We saw some favourites like Blank & Jones mixing, as well as a live performance by Infected Mushroom at the very end of the rave. It was a whole lot of fun. 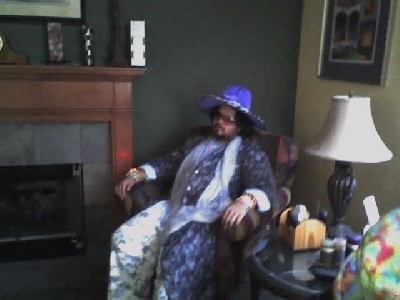 Isaac, in true Isaac fashion, dressed as a pimp. We drove back to Camarillo and all sort of crashed and went to sleep at around 06.00 in the morning at Matt’s house. We spent the rest of the day hanging out at Matt’s house because his parent’s were out of town. Went into Matt’s Jacuzzi in the evening and when we decided we were tired, went to bed for an actual-full night’s worth of sleep. It was a very relaxed and laid back day. Monday morning most people had left. We met up with Mallory and Sarah and we went and got lunch at The Habit. Later in the day we ended up over by Daphne’s just sitting around enjoying the outside “fresh” air while eating ice cream, or drinking a smoothie with Isaac, Abby, Sarah, and Matt. We went to Sarah’s house for a bit, later met up with a friend of Abby’s, Alisha, and towards the end of the evening we all ended up at my house and Matt and I mixed a bit for everyone. Then the weekend concluded with a shower and bed. Tuesday was school-day. My last class, English, was cancelled (although, I only found out that it was cancelled the following Thursday..) and Chelsea and I went and visited Mike after picking up Baja Fresh for lunch. We later met up with Grant and then went to dinner. Wednesday was a day at work. I don’t particularly recall much interesting about Wednesday, except for my lunch at three in the afternoon. I stayed home all evening long for I had been out and about every evening prior and sort-of felt like a little break. As it often does, Thursday came by. English class was cancelled again. As Matt and I headed for my car, some guy named Rodney asked if we were going to Thousand Oaks. We weren’t, but we weren’t really going anywhere at all so we said yes, and gave the guy a ride over to Ventu Park Rd. We made a stop by Borders before heading back to Moorpark to pick up Chelsea (we all car-pool) and then drove back to Camarillo. I hung about at home. In the evening the family and my visiting cousins had a last-at-the-house-dinner before they would leave and head back home to Switzerland. After dinner and a stomach-ache, I drove to Edwards (in 10 min!) to meet up with Mike, Grant, and Chelsea to see a wonderfully ridiculous yet thoroughly enjoyable movie titled “Crank.” Worth seeing if you like senseless violence, action, and a bunch of completely unrealistic scenes. T’was good though. Friday was a work day. For lunch everyone in the office was invited to a lunch out by the country club in Spanish Hills. It was very good. The lunch was to say goodbye to one of the main and rather key people of the company who was leaving for bigger and better things. Additionally, it was also the last day for one of the Sales people. Two people left the small, now 10 person company in one day. Towards the end of the day I moved my stuff from my reception-desk to Jon’s desk (the guy who was leaving.) Now I’m no longer the receptionist that’s not actually a receptionist! Woo! On the other hand.. now that Jon is gone.. Brian and I are fucked. Friday evening my family went to dinner with my cousins and their friend, as well as Damon. We took two cars and headed over to Bandits. I sat next to my cousin Ursula and had a good time harassing her. In the evening I hung out with my cousins until around 01.30 in the morning. Soon there-after I went to bed, fell asleep, woke up.. and then said goodbye to my cousin Ursula and her friend Marrian who then left for LAX.. L * sigh * My cousin Anna leaves tomorrow morning at 06h something. They’ve been here for two or so months. Even though they weren’t around all that much (and perhaps I was not as well) it was still nice to have them around. I’ve always felt rather close to my cousins, and I’ve always liked them very much. Hm.. And there you have it.. a quick, rough and terribly crappy summary of my past week. A summary which really doesn't do the week any justice. Maybe I'll add more later. It may not sound it, but it’s been a pretty damned fun and good week. One that has been more memorable than most. It also really seems to mark an end to the summer. Go out with a bang was the philosophy behind this past week. So.. Summer is gone.. What will come next? I wait and see..